Giving a fillip to the country’s renewable energy programme, the new government led by Shri Narendra Modi has taken a slew of decisions in a span of six months to boost “Clean Energy” in the country. These include providing support to Rs 1000 crore to Central Public Sector units to set up over 1,000 MW grid connected solar photovoltaic power projects, setting up of 25 solar parks each with a capacity of 500 MW requiring financial support from the centre of Rs 4050 crore and setting up of over 300 MW of solar power projects by Defence and Para military establishments. With these decisions, India will emerge as a major solar power producing country as nowhere in the world are solar parks are being developed on such a large scale. The Government restored Accelerated Depreciation benefit in the Union Budget 2014 to give much-needed relief to wind power developers and to ensure ramp-up of production. This will enable to kick start & ramp up wind capacity addition expeditiously. The Government amicably resolved the anti-dumping duty dispute. A whole host of measures have been undertaken to make India “Solar manufacturing” hub with priority for domestic players in line with “Make in India” programme. With these initiatives, domestic manufacturers will have greater visibility on order books, have an opportunity to upgrade technologically and be able to reduce costs. In order to facilitate speedy growth of Renewable energy Power generation in the country, the Ministry of New and Renewable Energy (MNRE) is preparing a Renewable Energy Bill. This apart, the Ministry is also preparing a scale up plan for the development of Solar in the next five years. Outlining the new government’s priorities in the energy sector, President Shri Pranab Mukherjee, while addressing the first session of both Houses of Parliament after the elections to the 16th Lok Sabha, said that the government will come out with a comprehensive National Energy Policy and focus on development of energy related infrastructure, human resource and technology. The aim of the government will be to substantially augment electricity generation capacity through judicious mix of conventional and non-conventional sources. It will expand the national solar mission and connect households and industries with gas-grids. To showcase India`s renewable energy potential globally, the MNRE in partnership with Indian Renewable Energy Development Agency Limited (IREDA), the Confederation of Indian Industry (CII) and the Federation of Indian Chambers of Commerce and Industry (FICCI) is organizing the Global Renewable Energy Investment Promotion Meet (RE-INVEST) from 15-17 February, 2015 as a follow-up to the `Make in India` initiative launched by the Prime Minister . RE-INVEST will enable the global investment community to connect with the renewable energy stakeholders in India. The Government has recently approved a Scheme for setting up of 25 Solar Parks, each with the capacity of 500 MW and above and Ultra Mega Solar Power Projects to be developed in next 5 years in various States and will require Central Government financial support of Rs 4050 crore. These parks will be able to accommodate over 20,000 MW of solar power projects. 12 states have so far given consent for setting up of Solar Parks. They are: Gujarat, Madhya Pradesh, Telengana, Andhra Pradesh, Karnataka, Uttar Pradesh, Meghalaya, Jammu & Kashmir, Punjab, Rajasthan, Tamil Nadu and Odisha. The solar parks will be developed in collaboration with State Governments and their agencies. Under this Scheme over 300 MW of Grid-Connected and Off-Grid Solar PV Power Projects will be set up by Defence Establishments under Ministry of Defence and Para Military Force under Ministry of Home Affairs (MHA) with Viability Gap Fund (VGF) under the Jawaharlal Nehru National Solar Mission (JNNSM) in five years that is from 2014 to 2019. Under the Scheme there is a stipulation of mandatory condition that all PV cells and modules used in the solar plants set up under this Scheme will be made in India. To implement this Scheme a provision of an amount of Rs 750 crore for MNRE from the National Clean Energy Fund has been earmarked. The Government has also approved the Scheme for setting up of 1000 MW of Grid-Connected Solar PV Power Projects with VGF (Viability Gap Fund) support of Rs.1000 crore, by CPSUs under various Central/State Schemes, in three years period from 2015-16 to 2017-18. The Scheme will have a mandatory condition that all PV cells and modules used in solar plants set up under this Scheme, will be made in India. The CPSUs and Government of India organisations like NTPC, NHPC, CIL, IREDA, Indian Railways, etc. are coming forward to set up solar power projects. On the request of MNRE, Ministry of Environment and Forests has decided that classification of Solar, Wind and Small Hydro Projects be out of Red Category to Green Category under Central and State Pollution Control Boards. CPCB has issued an amendment in the categories of industries, according to which the Wind and Solar power projects of all capacities and Small Hydro projects of <25 MW capacity have been put in Green category, i.e. the project developers to obtain clearance from SPCB to “establish and operate” only once in the beginning. The Government approved the following schemes for their continuation during the 12th Plan period: (i) National Biogas and Manure Management Programme (NBMMP), (ii) Scheme to Support Promotion of Grid-Interactive Biomass Power and Bagasse Co-generation in Sugar Mills, (iii) Programme for the Development of Small Hydro Power, and (iv) Off-grid and Decentralized Solar Applications under JNNSM. The Budget Estimate of the Ministry is increased by 65.8% to Rs.2519 crore in the Regular Budget passed by the Parliament in July from Rs.1,519 crore provided in the Interim Budget. Clean Energy Cess on coal has been increased from Rs 50 per tonne to Rs 100 per tonne so that adequate funds are available for financing Renewable Energy projects. After significant harm was done to the wind sector due to withdrawal of AD with effect from 1.4.2012, it has been restored on 18.7.2014. This decision of the Government will help in creating a robust manufacturing base of wind turbines in the country. MNRE launched a Scheme for Development of Grid Connected Solar PV Power Plants on Canal Banks and Canal Tops in the country during the 12th Plan period at an estimated cost of Rs. 975 crore and with Central Financial Assistance (CFA) of Rs. 228 crore. The objective of this scheme is to achieve gainful utilization of the unutilized area on top of Canals and also the vacant Government land along the banks of Canals wherever available, for setting up Solar PV power generation plants for feeding the generated power to Grid and to set up a total capacity of 100 MW solar PV power projects. The Department of Financial Services under the Union Finance Ministry has advised all banks to encourage home loan/home improvement loan seekers to install roof top solar PVs and include the cost of equipment in their home loan proposals just like non solar lighting, wiring and other such fittings. Apart from this , the RBI have issued instructions to all Scheduled Commercial Banks that the loans sanctioned by banks directly to individuals for setting up off-grid solar and other off-grid renewable energy solutions for households will be covered under Priority Sector lending. Unnat Chulha Abhiyan9uca) Programme with the objectives to develop and deploy improved cook-stoves for providing cleaner cooking energy solutions in rural , semi –urban and urban areas using biomass as fuel for cooking launched. This will save rural women from the carcinogenic fumes emitted when traditional fuels are burned. · The Agence Francaise de Development (AFD) of France has decided to extend a Line of Credit (LoC) of Euro 100 million to Indian Renewable Energy Development Agency Ltd. (IREDA), for the tenure of 15 years without any guarantee from Government of India, for financing the Renewable Energy and Energy Efficiency projects in the country. An agreement to this effect was signed between AFD and IREDA on 22 May, 2014. · Indian Renewable Energy Development Agency (IREDA) Ltd and Japan International Co-operation Agency (JICA) signed an Agreement for availing another Line of Credit (LoC) of JPY 30 billion for 30 years (including the grace period of 10 years) from JICA according to which IREDA shall utilize the funds for financing Renewable Energy projects in India. · A Memorandum of Understanding (MOU) has been signed by IREDA and US Exim Bank with respect to cooperation on clean energy investment. As per MoU, US Exim Bank shall provide US $ 1 Billion medium and long-term guaranteed and/or direct dollar loans to finance U.S. technologies, products and services utilized during commercial development activities within the clean energy sector by IREDA. An MOU was signed on 1st October, 2014 for setting up a Joint Venture Company (JVC) to undertake first Demonstration Offshore Wind Power Project in the country along the Gujarat coast. 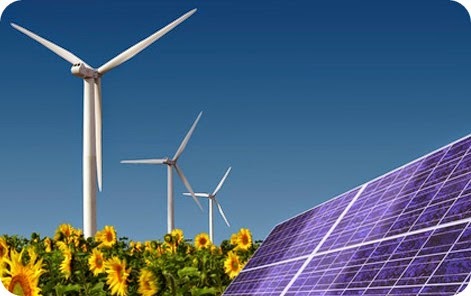 The signatories of the MoU were Ministry of New and Renewable Energy (MNRE), National Institute of Wind Energy (NIWE), and Consortium of partners consisting of National Thermal Power Corporation (NTPC), Power Grid Corporation of India Ltd (PGCIL), Indian Renewable Energy Development Agency (IREDA), Power Finance Corporation (PFC), Power Trading Corporation (PTC), and Gujarat Power Corporation Ltd (GPCL). The JVC will undertake detailed feasibility study and necessary steps as deemed necessary for implementation of the first offshore demonstration wind power project. To promote the interaction amongst the State Nodal Agencies (SNAs) implementing the renewable energy programmes to enable them to learn from each other`s experiences and share their best practices, MNRE took an initiative in consultation with SNAs and formed an Association of Renewable Energy Agencies of States (abbreviated as "AREAS), registered as a society on 27 August 2014, under Society Registration Act 1860.